I’ve had the bilingual version of Michael W. Smith’s “Agnus Dei” as an ear worm since last Friday’s Conference Assembly. 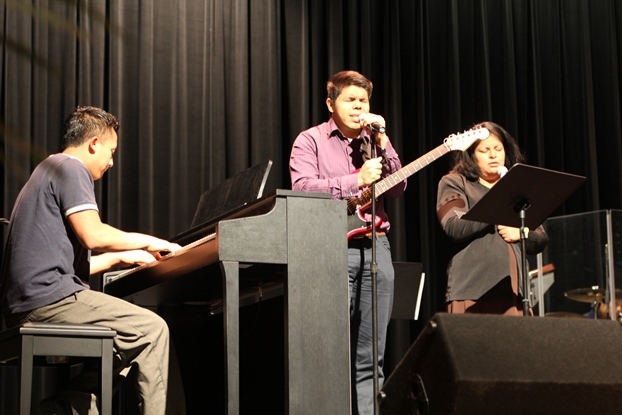 A small ensemble from Centro de Alabanza led the song as a response to Nate Stucky’s sermon on Friday night, moving smoothly from English to Spanish and back again. The Alleluia’s were markedly the same words in all three of the languages posted on the screen up front (English, Spanish and Indonesian). The four musicians later told me that they were shaking as they went up front to lead. This was a large group to lead, close to 200 people. Shifting back and forth between English and Spanish while you’re nervous is especially challenging. But something seemed to happen to us as we sang. I heard Indonesians behind me move readily into Spanish; in other parts of the auditorium at Dock Mennonite Academy EC-8 campus, Tanzanians did the same thing. 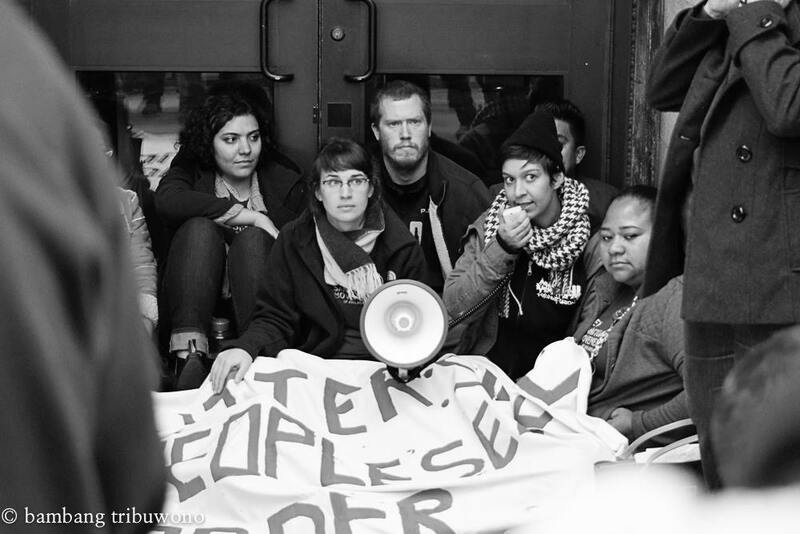 We were moved to stand together without an invitation to do so. Some of us raised hands. There were some tears. There was some speaking in tongues (and I can verify that the languages were not of our assortment of languages that we normally speak outside of English). For years, we’ve struggled in conference assembly over worship styles and songs and languages. We’ve tried hard to incorporate all of our worshipping languages and song preferences. Some of us fold our hands when hymns aren’t sung. Others of us feel lost when we’re singing in a language other than our native tongue. Some of us can’t figure out how to sing the soprano line when we try to break into four parts. Sometimes we feel the Spirit and sometimes we don’t while others have. This time I felt the Spirit somehow pull us into words meant to mimic those of the eternal city of God in their Agnus Dei, based on a passage from the Book of Revelation. St. John of the Cross called this something that I sensed to be on the brink of something, “I know not what.” In the seemingly smooth transitions between English and Spanish led by a young group of worship leaders on vocals, keyboard, guitar and drums — who were there in fear and trembling –something quite beautiful emerged. Maybe that was the key to open us up together; their humility might have made it all possible, inviting others to worship along with them with a sense of nervousness and awe. After the worship, around ice cream, I noticed this crazy mix of people that we are: refugees, migrants, immigrants, citizens; millionaires and those only a payday away from living on the street again; from the mountains, suburbs, small towns, Allentown, Philadelphia, metro DC and NYC. While serving regular, sugar free and lactose free ice cream, I noticed who we are. How beautiful it is, when on one night even 5% of our community of approximately 7000 joins together from across our geographies to gather, sing, listen, pray, and re-group in our shared identity … to feel even a glimpse of Pentecost that binds us within and beyond language, through a group of us who lead with honest fear and trembling. I’ve been grateful this week to have this song in my head as a reminder beyond the election’s possibilities and fears, that calls me to identify where real citizenship and purpose abides — in the reign of God, among the communion of the saints, by the power of the Spirit who unites us across our differences and languages. This is who we are called to be, both in the here and now and into all eternity. Holy, Holy is the Lord God Almighty. Santo, Santo. El Senor es Poderoso. Kudus,Kudus Engkaulah tuhan berkuasa. I’ve been in a lot of meetings where there’s discussion about decline in the church. But every time I hear it, I think about the churches I work alongside. While I know numbers are down in a lot of places, that is not the reality in most of Franconia Conference churches in Allentown and Philadelphia. In South Philadelphia alone, among three conference churches we have 500 members, almost 10% of the conference. This past Sunday I spent the day visiting these congregation. First I worshipped with Philadelphia Praise Center (PPC), which is my home congregation. I was the oldest person on the platform during worship. There’s a growing number of children and lack of Sunday school space. Worship was energetic and bilingual. 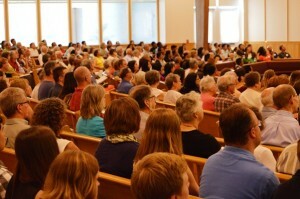 The congregation counts about 150 people as part of the community. After worship, I migrated down to the new building for Nations Worship Center (NWC). The long delay with the permitting process is frustrating, so the congregation continue to meet in rented space on South Broad Street. Worship attendance can go as high as 150 people not including special programs. They’re anxious to finish the building on Ritner, about six blocks South of PPC’s building. While they will be close to PPC, both churches reach different demographics among the 5000 or so Indonesian speakers in South Philadelphia. After conversations at NWC, my next meeting was to explore a new facility for Centro de Alabanza. Officially a conference member congregation only since this fall, the church needs to relocate again after outgrowing their worship space just off Passyunk. It looks like they’ll move to purchase an old United Methodist building on Snyder Avenue. Under the capable leadership of their pastors and a leadership team from across Latin America, the church continues to grow with over 100 adults and 50 children under the age of 18. Just up north of these three properties is Indonesian Light Church. It’s the smallest of our South Philly congregations and just joined the Conference this past fall. Our Executive Minister, Ertell Whigham, was preaching this Sunday. 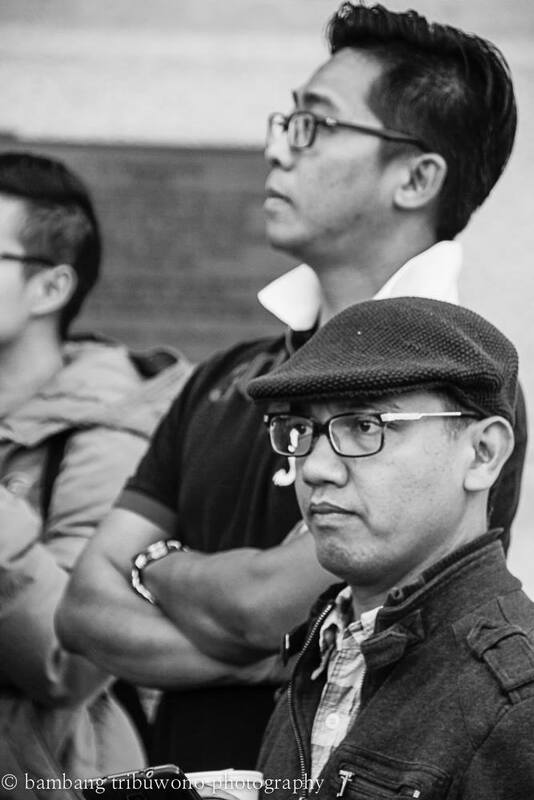 Emily Ralph Servant is serving as an interim pastor as they immerse themselves further in Anabaptist identity, and Bobby Wibowo from PPC is serving his seminary internship with the church. Most of the church is from the Batak tribe from Sumatra, though they speak Indonesian as well as their tribal tongue with most members from the neighborhood, with others driving from New York to attend. 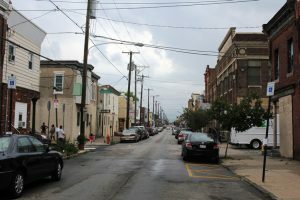 Over the last decade, unexpectedly, God has built a connection between Franconia Conference and the growing immigrant population in South Philadelphia. This is what fruitful investment and going to the margins of our communities might mean over the long haul. It’ll have meant purchasing about $1 million in property in the city and 500 members in the neighborhood. But this work takes time and patience. We’ve learned some things along the way. And we’ll keep learning. As we explore going to the margins again, as our churches in the Lehigh Valley and in South Philly begin to fill up and to represent increasing percentages of our Conference population, we’ll be required to rethink and reimagine what it means for us to be together. And we’ll discover, hopefully, again the God who brings about transformation and even resurrection. I was struck by the powerful words of the songs that we were singing together on Sunday in this former-thrift-store-turned-worship-space packed to nearly overflowing: we are not afraid… we believe… The words were punctuated with amens, raised hands, “Gloria A Dios.” This is Centro De Alabanza, an outgrowth of Philadelphia Praise Center, now a congregation of its own among the growing Spanish-speaking population in South Philadelphia. We were singing redemption songs that add strength and meaning to immigrant life in this thriving and sometimes dangerous city. On Sunday we celebrated the pastoral licensing of Fernando Loyola and Letty Cortes as ministers in Franconia Conference. Letty was radiant, clothed elegantly with gifts she said were from women in the congregation. Fernando, steady, firm, serious as usual in the task of leading. They lead together as a team, the boomerang of the fruit of Mennonite mission efforts from Franconia Conference to Mexico City in the 90’s. No one would have expected that support for Kirk Hanger, who left his role at Methacton Mennonite to work at church-planting in Mexico City, would have meant that Centro de Alabanza would emerge to join Franconia Conference. God multiples the small things and the licensing of Fernando and Letty are proof of that. Fernando tells the story of his conversion as one that takes a lifetime. Letty is the first woman of color recognized as a pastoral leader in Franconia Conference, over 25 years after the first woman (Marty Kolb-Wycoff) was credentialed for ministry in Vermont. In working with credentialing new leaders and in the slow work that we do in establishing new congregations, I cannot help but see all of the connections that make new things possible. I notice the small things along the way that when invested in the dream of God, result in unexpected blessing and possibility. It is the widow’s mite given in faith and generosity, the mustard seed that grows into a tree, the leaven that transforms the whole loaf of bread. We ate together after the two-hour plus worship. There was chicken, rice and beans, Coke along with orange, grape and pineapple soda. I thought of how similar it felt to the times I’ve visited with Mennonite Churches in Mexico City, yet I was still in my home city in the state where I was born. I fumbled through conversations in Spanish, but remembered best the words that I learned from Ruth Hunsberger, my Spanish teacher at Johnstown Christian School, who learned Spanish herself while working in Puerto Rico in the 40’s. My Spanish will thus always sound both a bit Pennsylvania Dutch and a bit Puerto Rican. We bring all of those gifts and parts, all of who we are, all of the possibilities and relationships into the great Matrix of God … and they are used. Nothing is lost, everything is found and even the smallest thing can mean real transformation. Kirk told the story of meeting Letty while washing dishes in Mexico City. 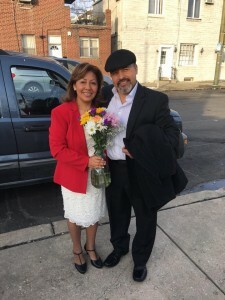 A wholly ordinary conversation that has led eventually to this new community flourishing in South Philadelphia and the naming of the first Latina Mennonite minister in Franconia Conference. And for those small things, which become eternally significant, and the ability to notice them later and to celebrate together over pollo, frijoles y arroz, I am grateful. Stephen Kriss is Director of Leadership Cultivation & Congregational Resourcing at Franconia Conference. 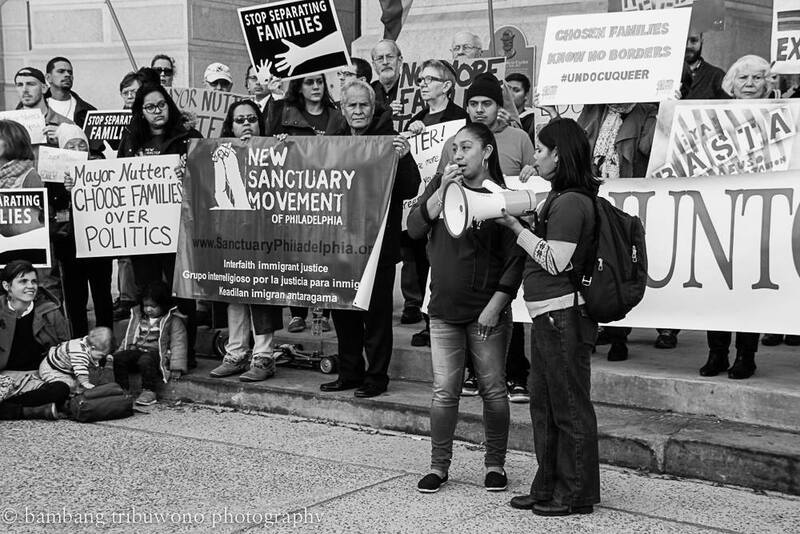 Over the last month Philadelphia has been abuzz with the news that Philadelphia Mayor Michael Nutter planned to reverse the city’s “sanctuary order” that has been in place since April 2014. 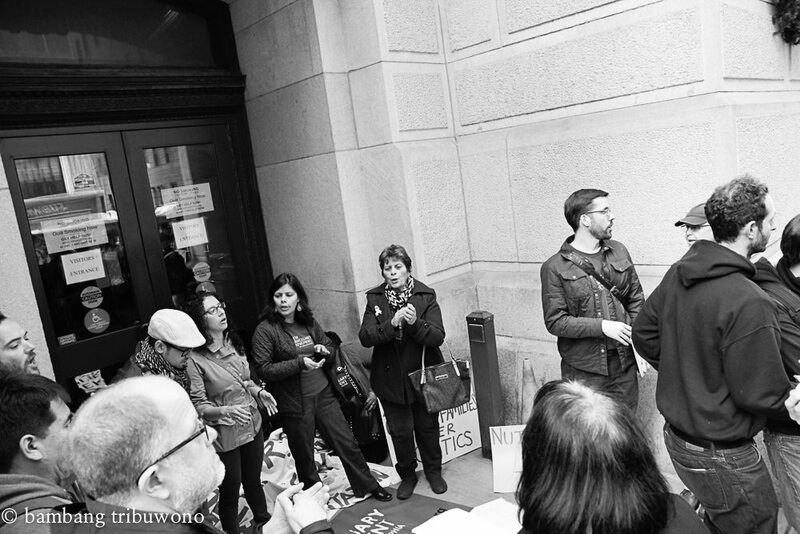 The sanctuary order protects Philadelphia residents from deportation by preventing the police from collaborating and sharing information with the Department of Homeland Security’s Immigration and Customs Enforcement (ICE) agency. 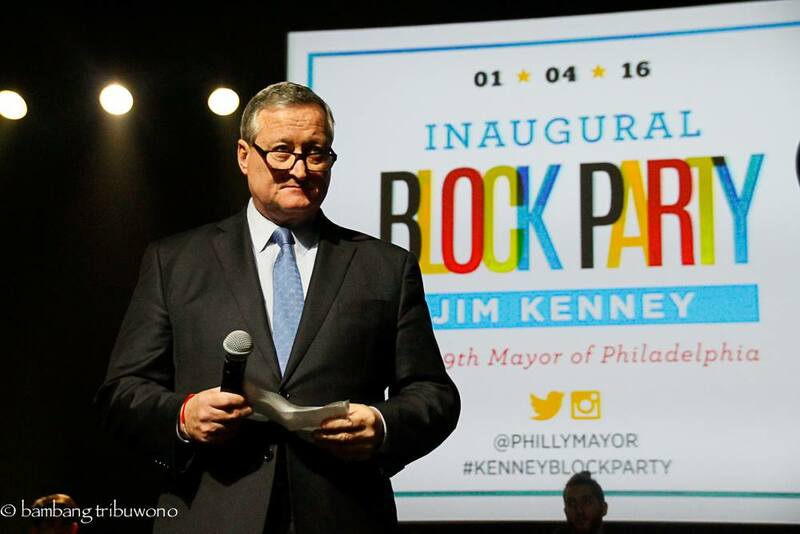 This news impacts the Conference’s city-based congregations, particularly those with significant numbers of recent immigrants including Centro de Alabanza de Filadelfia, Indonesian Light Church, Nations Worship Center and Philadelphia Praise Center (PPC). 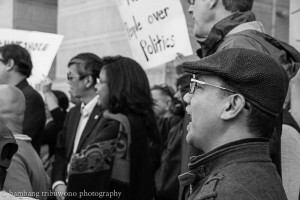 On December 11, when Mayor Nutter was to sign the reversal of the sanctuary order, New Sanctuary Movement called on faith leaders to join an action at City Hall to show the disagreement with the reversal of the sanctuary order which organizers of the action said puts families at risk of being torn apart and the language used by the Mayor’s administration about the reversal has perpetuated Islamaphobia that is currently widespread in the country. 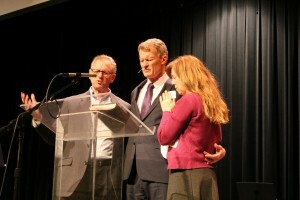 Pastor Aldo, along with others from PPC, Fred Kauffman, interim pastor at Methacton congregation and Amy Yoder McLaughlin, pastor at Germantown Mennonite Church, with many others from Philadelphia and the surrounding area, immigrants and non-immigrants, documented and undocumented, answered the call. 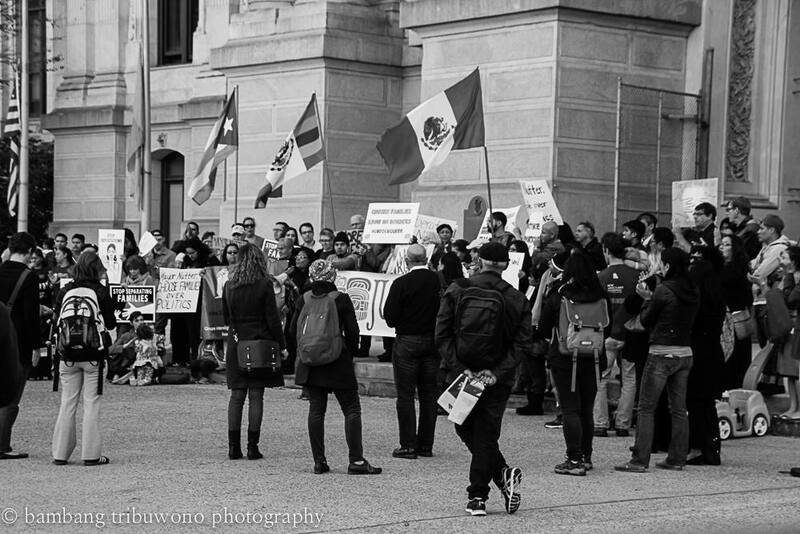 The action included speakers at a rally in front of City Hall, along with a time of prayer. 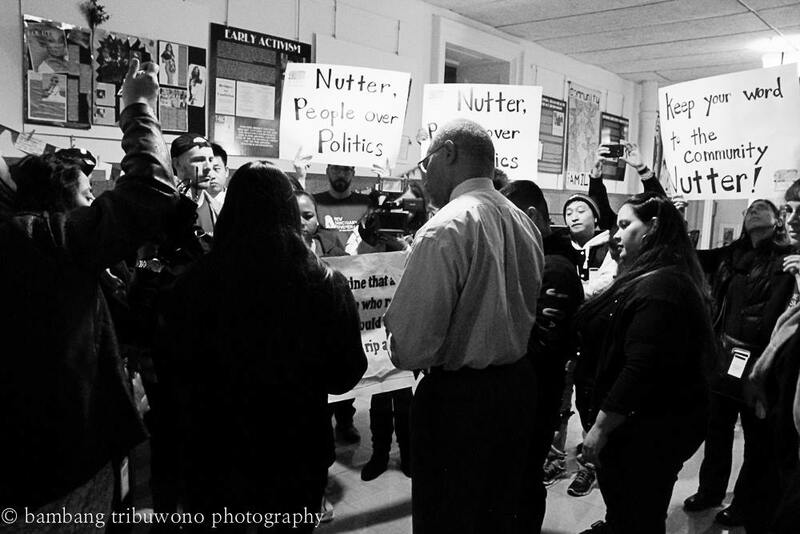 A few New Sanctuary Movement leaders went into City Hall and requested to speak with Mayor Nutter. 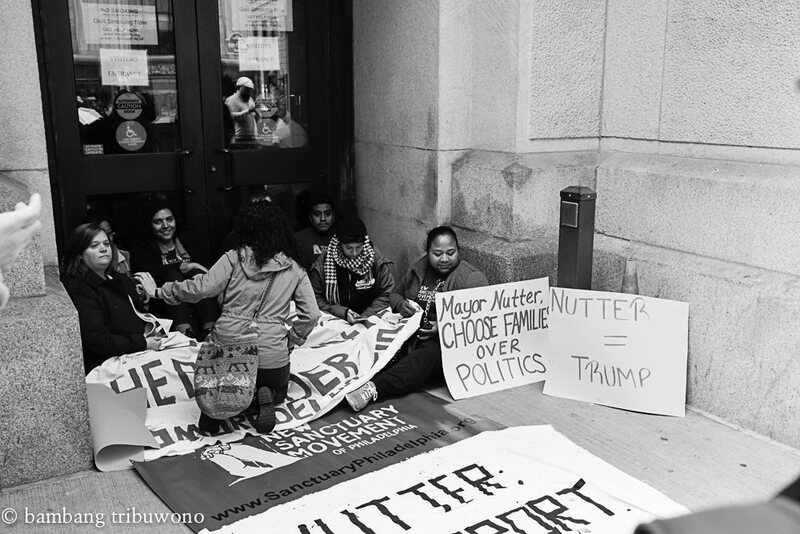 At that time, others in the movement blocked the entrances to the building to raise awareness about the possibility of Mayor Nutter signing the reversal of the sanctuary order. With a new year, came new hope, and a new mayor. 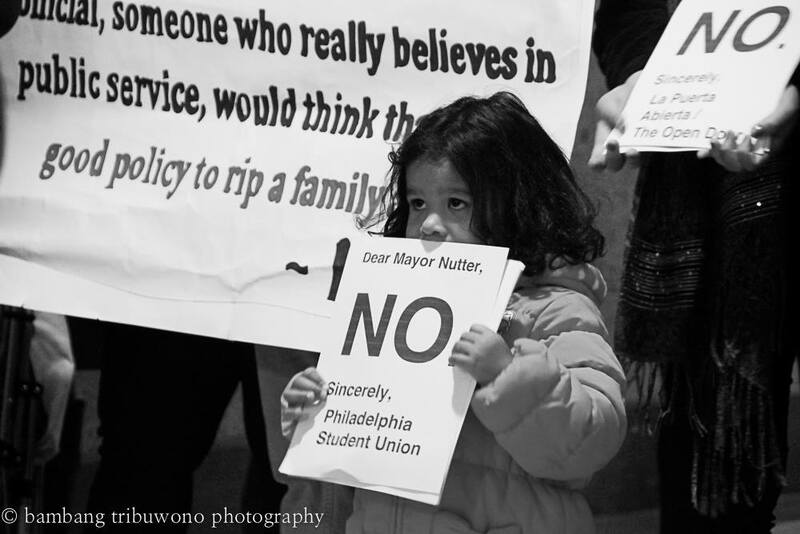 Mayor Jim Kenney took office on Monday, January 4th and one of his first actions as mayor was to reinstate the sanctuary order. Many rejoiced over this news. Pastor Aldo has said it is important that those among us who are immigrants feel welcome and supported. 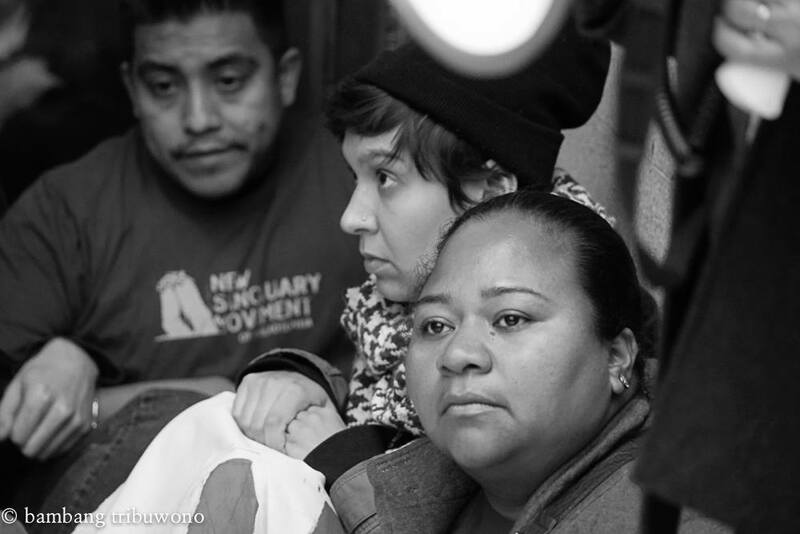 This can be done through prayer, fellowship and supporting the efforts of people like the those in the New Sanctuary Movement. 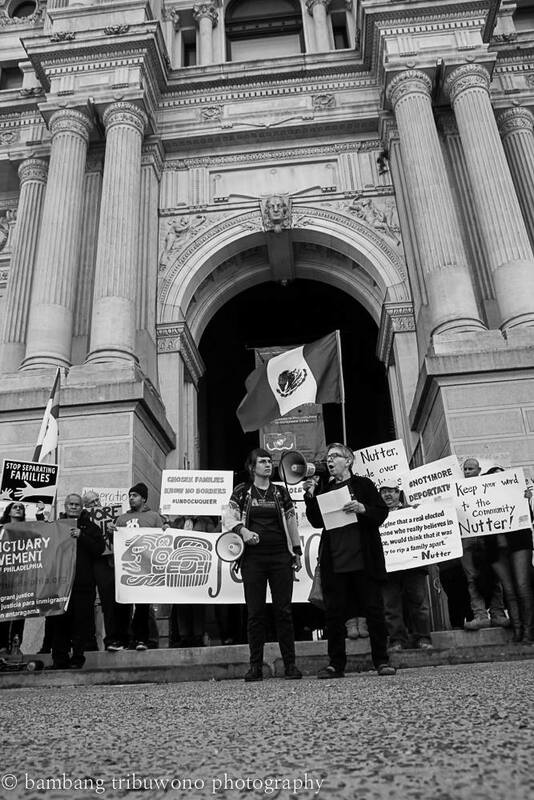 A current campaign of the New Sanctuary Movement that could use support is their efforts to have driver licenses accessible to undocumented people in Pennsylvania. Eleven states, Washington, DC and Puerto Rico currently offer driver licenses to those who are undocumented. Not having access to a driver’s license means that a person undocumented risks deportation anytime they drive — whether to go to work, school, to access health care, or to buy groceries. 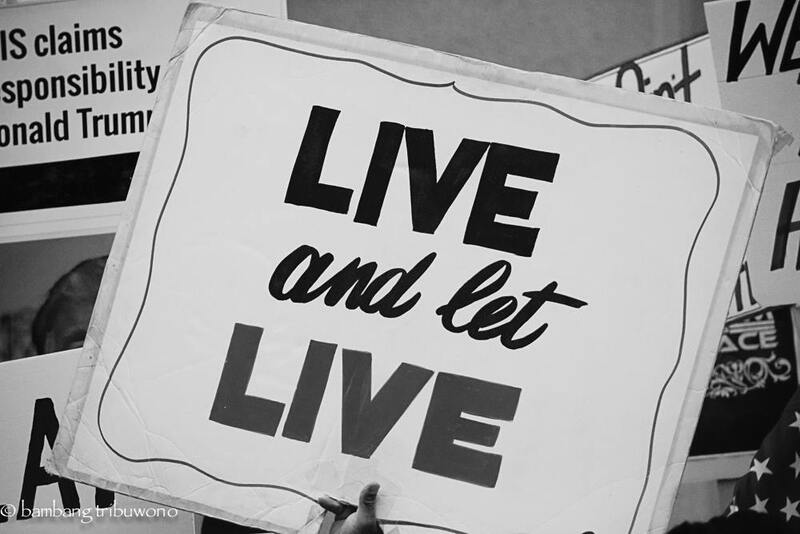 To learn more about New Sanctuary Movement visit: http://www.sanctuaryphiladelphia.org/. To visit PPC, Indonesian Light Church, Centro de Alabanza or Nations Worship Center, visit the conference directory here for service times and locations; all are willing to translate their services into English as needed. Six Franconia Conference congregations banded together to organize an intercultural worship service called “The Gathering”. Several hundred people from different ethnic backgrounds, speaking different languages, gathered for this worship service at Souderton Mennonite Church on Sunday, July 19. In attendance were other Franconia Conference Church members, the members of Indonesian Light Church, along with the host families and around 30 participants from the Global Education Conference, a week-long Mennonite World Conference global educators’ meeting that was held the week before at Christopher Dock Mennonite High School. People gathered to worship, hear Scripture, listen to a sermon, and fellowship over food. 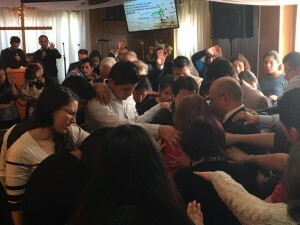 The service included Indonesian, Spanish, and English languages with the call to worship and sermon both being translated. The scripture reading was done in Hindi, French, and English. The event was a chance to “learn other cultures,” according to Carlos Aguirre, from Centro de Alabanza. He was impressed by the other Christians in attendance. “I will take away the joy that I have in my heart, to know that there’s other people helping the body of Christ to grow,” Aguirre said. 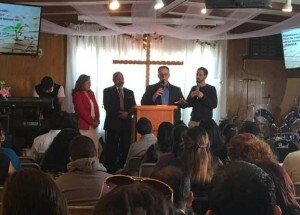 The Gathering was organized by Bally Mennonite Church, Centro de Alabanza de Filadelfia, Nations Worship Center, Philadelphia Praise Center, Salford Mennonite Church, and Souderton Mennonite Church. It was sponsored by the Franconia Mennonite Conference. The sermon was given by Dr. Paulus Wadjaja, professor and program director at Universitas Kristen Duta Wacana in Indonesia and member of the Mennonite World Conference Commission. 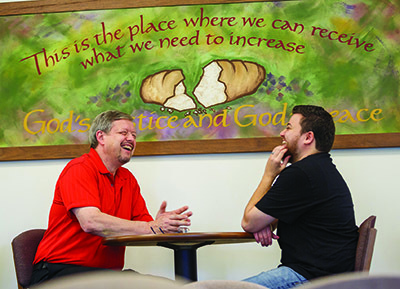 “I think we all left the service sensing God’s presence, realizing how God speaks in multiple ways through multiple people and recognizing that even if we’re not hearing our own language we can still lift our hands and be able to worship together knowing we’re worshipping the same God,” pastor Jim Laverty, Souderton Mennonite Church, said. 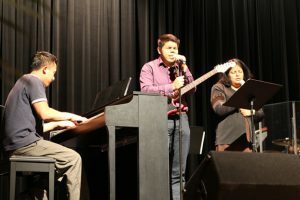 Worship songs, including English hymns led by Rob Yoder, Salford Mennonite, and Spanish contemporary songs lead by the Centro de Alabanza worship team, were among the worship sets. Nations Worship Center closed out the service by leading the congregation in “How Great Thou Art.” The first verse was sung in Indonesian. The tune was familiar enough for English-speakers to sing along in English, or they could join in by reading the Indonesian words from two large screens. The team then led the second verse in English. Following the worship service, all were invited to partake in a fellowship meal that included some Indonesian and Hispanic foods. People fellowshipped with one another while enjoying music played by members of Philadelphia Praise Center, Centro de Alabanza, and Indonesian Light. A multi-congregational event like this is a possibility for next year and following years, according to Laverty, who helped plan The Gathering. Franconia Mennonite Conference is looking forward to continuing to support churches in multi-congregational worship services throughout the year. 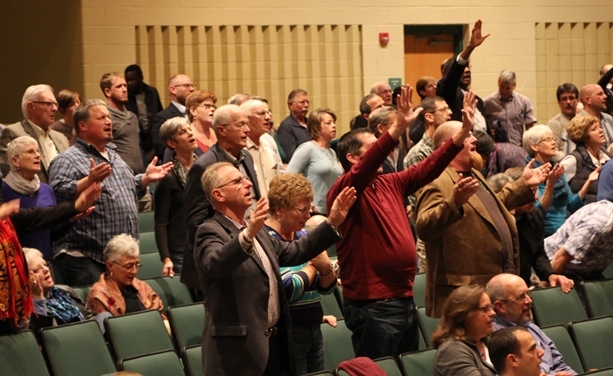 The conference assembly worship service is a time for Franconia Mennonite and Eastern District Conference members to join together in worshiping the Lord. This year’s conference assembly worship is scheduled for 7:00 pm, Friday, November 13th at Penn View Christian School. Kim-Mai Tang and Khoa Ho are part of the Year 1 Cohort (class of 2017) in Eastern Mennonite Seminary’s STEP program. Photo provided by EMU. 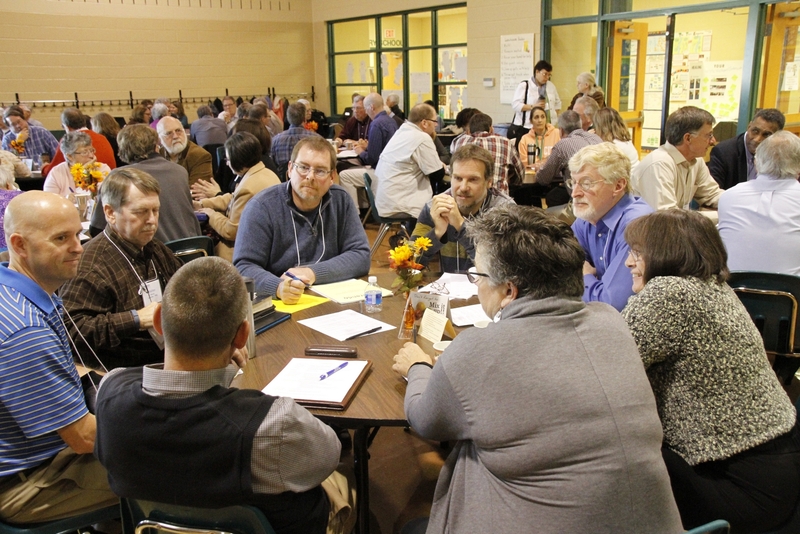 Flexibility is one of the critical ways the various schools associated with Mennonite Education Agency (MEA) are making theological formation and education accessible and relevant to urban churches. But flexibility alone is not enough. Urban church leaders are also looking for education solidly grounded in a global context and embedded in relational networks, not just institutional structures. In response a variety of Mennonite educational institutions have developed ser­vices meant to serve and learn from urban Anabaptists, often strongly rooted in a particular geographical center or located within a series of networks and partnerships. 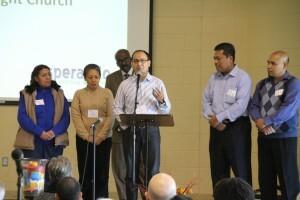 At Centro de Alabanza in Philadelphia each week, over 20 percent of the church community gathers to study and discuss courses offered by the Instituto Bíblico Anabautista (IBA, Anabaptist Biblical Institute) and facilitated by the congregation’s pastors, Fernando Loyola and Leticia Cortés. The IBA courses at Centro de Alabanza are held twice a week. Most of the participants at Centro de Alabanza are married couples, so men study one night and women the next. This way husbands and wives are able to swap child care during their respective class nights. “[IBA] has total flexibility,” says Rafael Barahona, IBA and the Hispanic Pastoral and Leadership Education office director. “So [the churches] can make it work for them.” IBA provides instruction manuals for students and training for facilitators, but it does not impose an external schedule on church groups using the program. 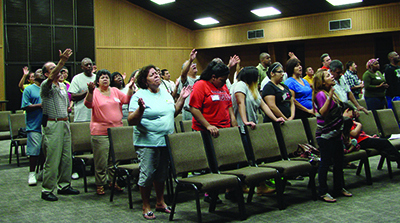 For Centro de Alabanza, this flexibility has been key. The ability to offer courses on a schedule that equally benefits husbands and wives from within the same households has had a tremendous effect on the congregation. “In my case with the women especially, they have more confidence that they are capable, that they can use their gifts,” said Cortés. An IBA student retreat. 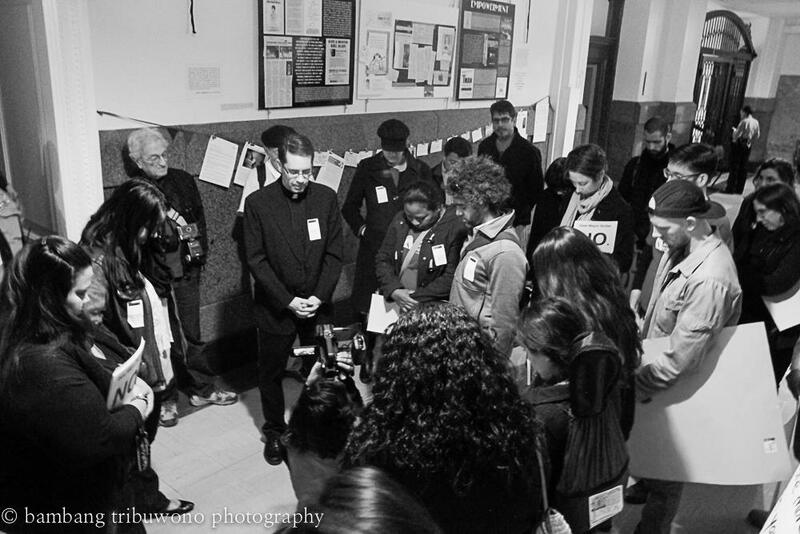 The 2014 retreat took place in Talladega, Ala. Photo by Violeta Ajquejay. Cortés has observed the women immediately putting into practice what they have been learning in the classes. Some have even started preaching in the worship services. 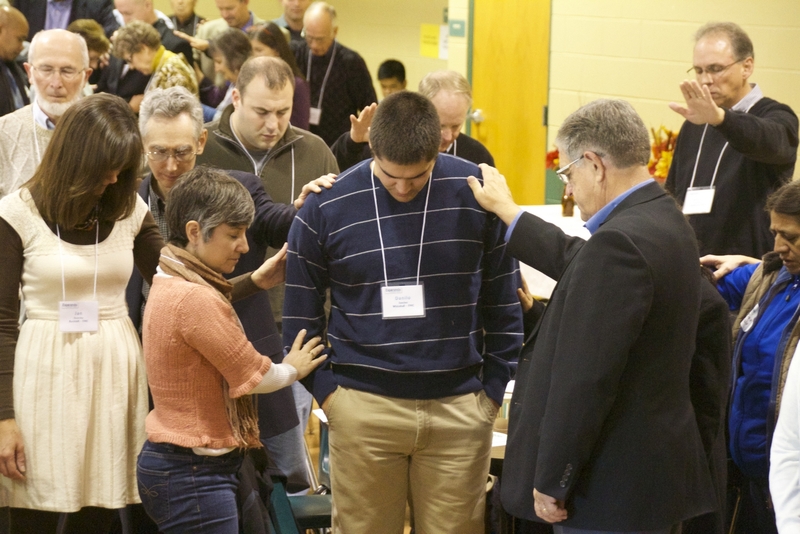 IBA is one of the longest-running and most expansive programs for urban Mennonite church leaders. Now in its 27th year, there are 42 centers serving around 300 students across the country, from New York City to Miami to Omaha, Neb. Eastern Mennonite Seminary, a graduate division of Eastern Mennonite University,operates a campus in Lancaster, Pa., that most directly serves the eastern part of the state, including many urban churches in Lancaster and the greater metro area of Philadelphia. “One of the things unique about the EMS program is that our programs are intended for urban dwellers,” says Steve Kriss, associate director of pastoral studies at EMS Lancaster and LEADership minister for Franconia Conference. While EMS Lancaster offers an M.Div. 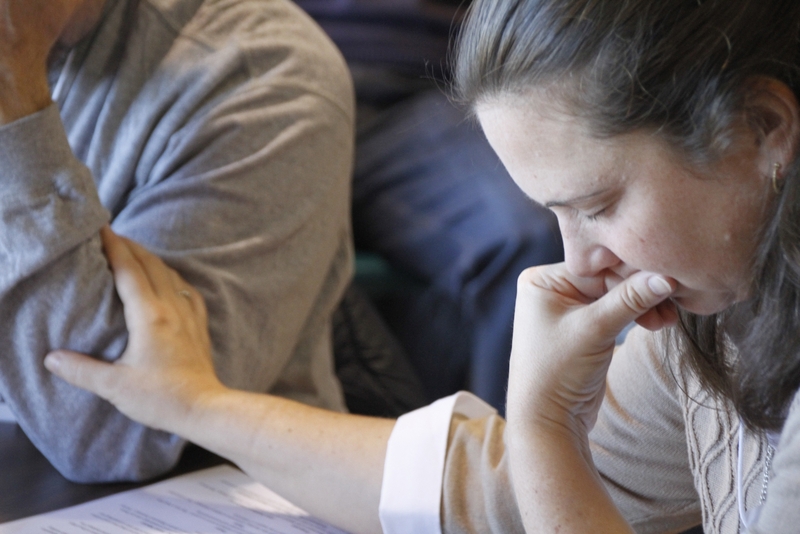 track and two graduate certificate programs, they also operate Study and Training for Effective Pastoral Ministry (STEP), an undergraduate-level program for church leaders who wish to strengthen their ministry and leadership experiences. 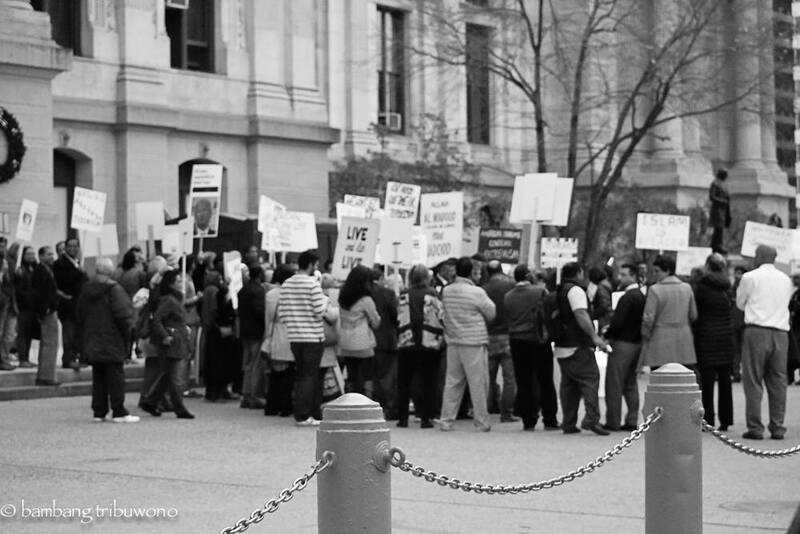 From the beginning, STEP was designed as a collaborative program, dependent on urban church networks and experience. An advisory committee from Philadelphia-area congregations helped design the original program, and teachers and students came from area Anabaptist congregations. “It was a very deliberate attempt to connect with the vibrant urban minority [and] recent immigrant congregations in the Philadelphia urban metro area,” says Mark Wenger, director of EMS Lancaster. STEP is grounded in practical experience and mentoring relationships. Everyone who joins STEP must already serve in a leadership role within his or her congregation, and each student is paired with a ministry mentor. By necessity STEP integrates global realities into the formal education experience. 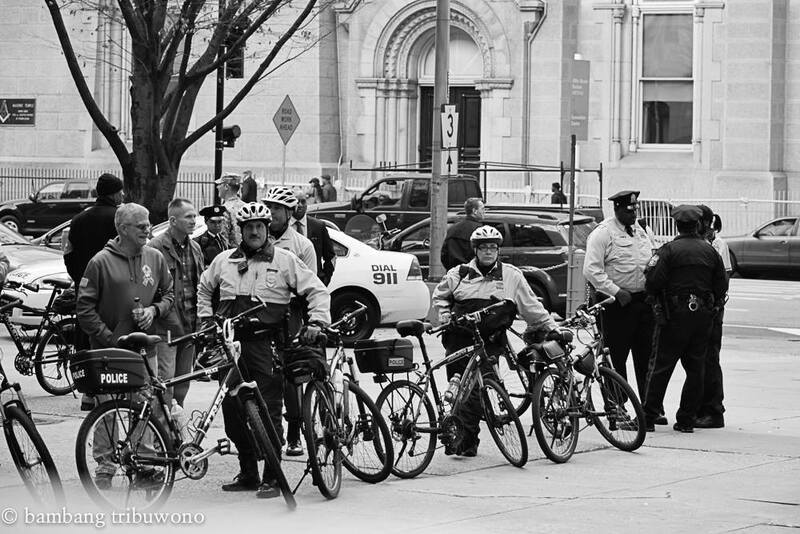 The urban congregations that partner with EMS Lancaster include Vietnamese, Latino, Anglo, African-American and Ethiopian ones. The diverse identities of these, combined with their urban context, bring global issues to the fore. Both EMS in Harrisonburg, Va., and Anabaptist Mennonite Biblical Seminary (AMBS) in Elkhart, Ind., offer courses in their graduate programs specifically focused on urban contexts and ministry. They also regularly receive students from nearby urban centers. In general, however, the seminaries report that it is the partnerships in urban-based theological education that have most strengthened their programs in this regard. AMBS, for example, is a long-standing member of the Seminary Consortium for Urban Pastoral Education (SCUPE). Rather than try to duplicate the courses and experience offered by SCUPE, AMBS encourages students to enroll in SCUPE’s courses in nearby Chicago. David B. Miller, associate professor of missional leadership development and AMBS-SCUPE program liaison, meets with advisee Martin Navarro. Photo provided by AMBS. According to Rebecca Slough, academic dean, SCUPE builds on the formation offered at AMBS while introducing students to a wider network of people. 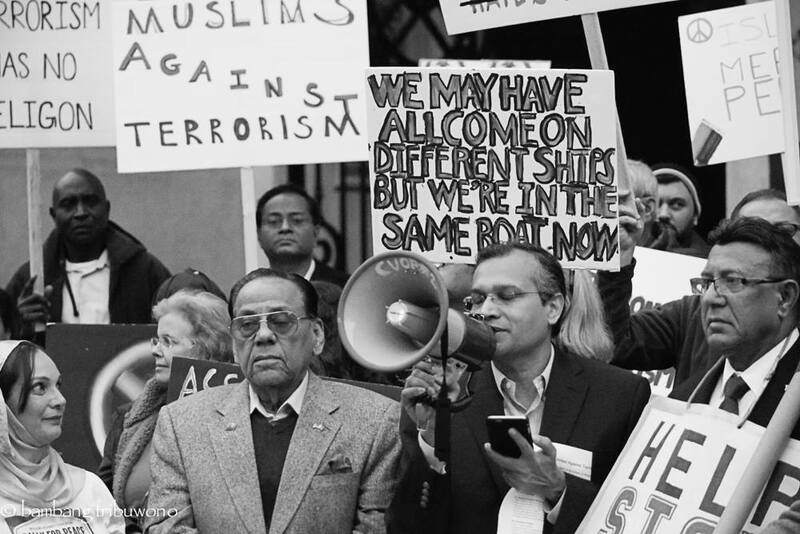 “It puts [students] in a different theological and racial-ethnic environment,” says Slough. Julia Gingrich, a 2014 AMBS graduate who lives and works in Elkhart, credits her SCUPE courses with giving her the tools to “exegete” her urban context. “[They] played a significant role in forming me as a missional leader who seeks to be deeply and consciously rooted in my ministry context,” she wrote in an email. The kind of partnerships and networks that have made IBA, STEP, and SCUPE possible are also crucial to the work of the Center for Intercultural and International Education (CIIE) at Goshen (Ind.) College. CIIE focuses on welcoming students from multicultural backgrounds—who are also often urban students—as well as working with organizations and churches that work with youth. “Many times we think urban students are more needy than other students,” says Gilberto Pérez, CIIE director. But he notes that urban students often have a level of resiliency and network navigation skills that is helpful for college. Adjusting to college without the proximity of their home network can be daunting, however, so CIIE pairs them with a student mentor. “The mentoring gives them a place to experience what they had in their home community,” says Pérez. While CIIE focuses much of its energy on the Goshen College community itself, it also sustains partnerships with 16 different community partners that work with students of color in locations all across the country. 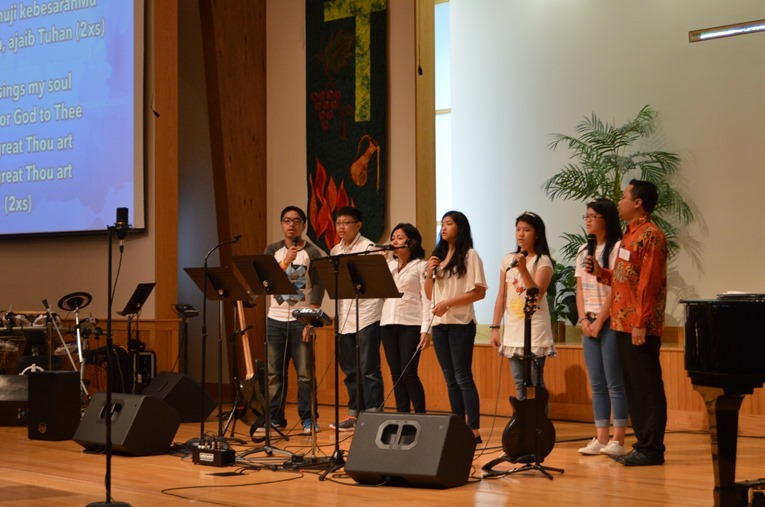 ReconciliAsian, an Anabaptist peace center that works mainly with Korean-American churches in Los Angeles, recently began a partnership with CIIE. Like the Philadelphia churches who partner with EMS Lancaster, ReconciliAsian finds their focus to ultimately be a global one. 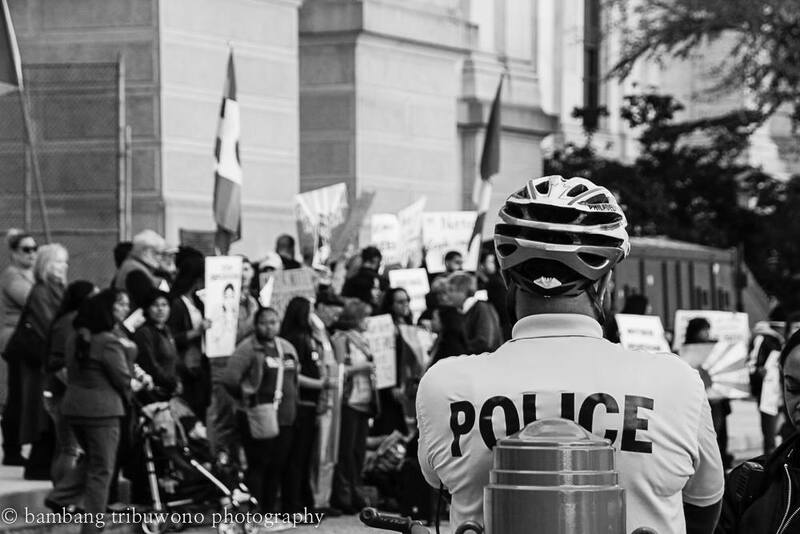 Their recent partnership with CIIE allows ReconciliAsian to reach what Park-Hur calls “invisible” youth in the Asian-American community who may not fit the “model minority myth” imposed on so many Asian-Americans. Park-Hur also hopes to speak at more family conferences with her husband, Hyun Hur. 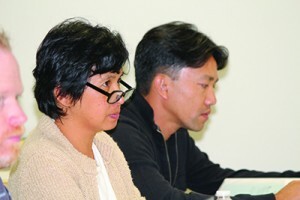 Their respective backgrounds as a Korean-American and a Korean immigrant make them uniquely equipped to communicate a message of conflict transformation across generational boundaries. Like many urban ministries, ReconciliAsian depends on a variety of relational networks and partnerships for its work. As important as networks and flexibility are to theological formation and education in urban contexts, they alone cannot respond to other challenges. Some urban churches, for example, want their youth to attend Mennonite colleges, but they fear those same young people won’t return after four years away. Cost is another hurdle. Some of the programs, like IBA, keep their costs low by using volunteer instructors. But accreditation comes with a price tag that can be particularly burdensome for urban churches and leaders. Yet relationships can go a long way toward sharing these challenges and adapting or creating new educational structures that better serve urban churches. Elizabeth Miller is a member of Berkey Avenue Mennonite Church in Goshen, Ind. Conference leaders pray for Danilo Sanchez, Whitehall, one of this year’s newly credentialed leaders. Photo by Bam Tribuwono. KrisAnne Swartley, Doylestown, joins in prayer for the other congregations at her table. Photo by Bam Tribuwono. The Franconia Conference Board asked delegates to consider what kind of conversations needed to be planned leading up to the Mennonite Church USA convention in Kansas City next summer, knowing the likelihood that Convention will include decisions about denominational structure and human sexuality. Many delegates agreed that the questions of structure and sexuality only skimmed the surface; perhaps there were other questions that should be asked instead. Delegates discussed difficult issues around tables with grace and laughter. Photo by Bam Tribuwono. Several new paths highlighted included a new Lehigh Valley collaboration in hiring Sanchez as youth minister, welcoming two new Philadelphia congregations (Centro de Alabanza and Indonesian Light Church) into an exploration of membership in Franconia Conference, and the move of the Mennonite Conference Center to the campus of Christopher Dock Mennonite High School in Lansdale (Pa.). 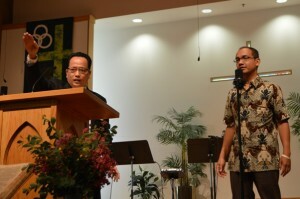 LEADership Minister Aldo Siahaan introduces two new congregations exploring membership in Franconia Conference: Centro de Alabanza and Indonesian Light Church. Photo by Bam Tribuwono. Although 2014 saw the beginnings of new ministries and the licensing of many new pastors, it also brought the deaths of three influential church leaders: Paul Lederach, John Drescher, and Israel Bolaños. In reflecting on their legacies, Kriss encouraged delegates to remember them by carrying on their work of teaching, writing, and mission.